American dramatist; born in Richmond, Va., Oct. 26, 1855; educated in the public schools of Richmond and New York. 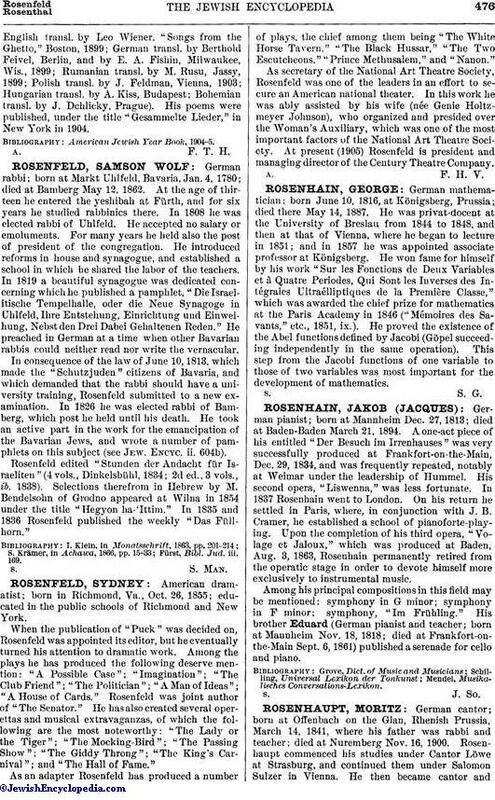 When the publication of "Puck" was decided on, Rosenfeld was appointed its editor, but he eventually turned his attention to dramatic work. Among the plays he has produced the following deserve mention: "A Possible Case"; "Imagination"; "The Club Friend"; "The Politician"; "A Man of Ideas"; "A House of Cards." Rosenfeld was joint author of "The Senator." He has also created several operettas and musical extravaganzas, of which the following are the most noteworthy: "The Lady or the Tiger"; "The Mocking-Bird"; "The Passing Show"; "The Giddy Throng"; "The King's Carnival"; and "The Hall of Fame." As an adapter Rosenfeld has produced a number of plays, the chief among them being "The White Horse Tavern," "The Black Hussar," "The Two Escutcheons,""Prince Methusalem," and "Nanon." As secretary of the National Art Theatre Society, Rosenfeld was one of the leaders in an effort to secure, an American national theater. In this work he was ably assisted by his wife (née Genie Holtzmeyer Johnson), who organized and presided over the Woman's Auxiliary, which was one of the most important factors of the National Art Theatre Society. At present (1905) Rosenfeld is president and managing director of the Century Theatre Company.